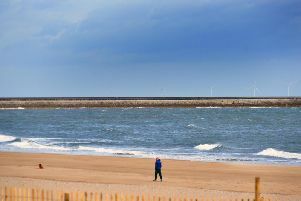 How long will the hot weather last in South Shields? July is just around the corner - and we've certainly been feeling it with a dose of summer sunshine over the weekend. We may be back to work today, but the sun has still got his hat on. And it's set to continue! South Shields is enjoying highs of 25°C today, with barely a cloud in the sky! It's the perfect day for a stroll along the seafront with an ice cream. Met Office forecasters have predicted the sunshine to continue, in part, for the rest of the week. There will be a bit of cloud on Tuesday and Friday, but temperatures will continue to hover at around 19°C heading into the weekend. And what a weekend it looks set to be! Clear skies and plenty of sun are on the agenda for Saturday - so pack your sunglasses, hat and cream and head for our beautiful coastline. Thursday is set to be a great day this week too, with highs of 20°C. If you're out and about in South Tyneside we'd love to see your pictures. Don't forget to share your weather pictures with us on social media. Click here for our Facebook and Twitter pages.